Finally I am at my computer and it's working and I can get it to load the photos. Must be time to share the last of the 'family' quilts. For this post I'm adopting Susan Briscoe, or at least our quilt. It isn't quite as cheeky as it sounds, I did at least quilt this one. It is called 'I can only do so much pink in one go'. 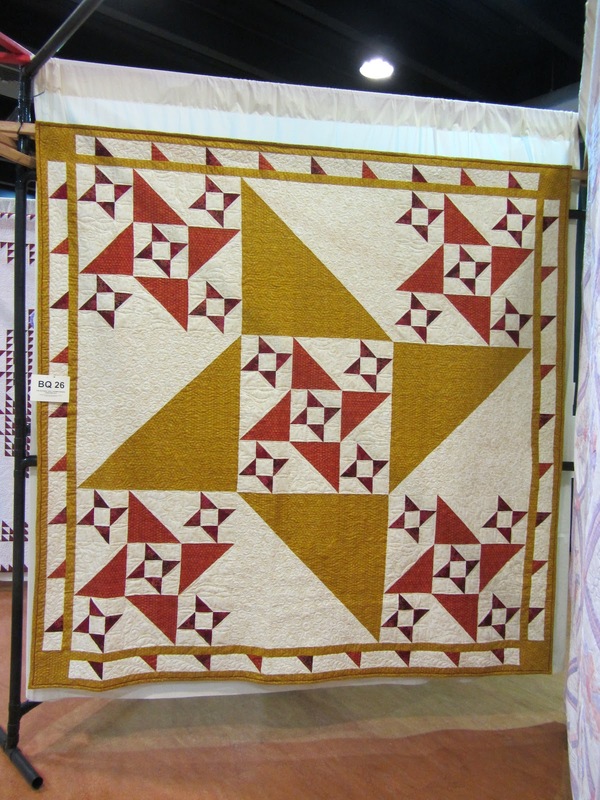 Susan says "After making a scaled-down replica of a quilt shown at the V & A's 2010 exhibition. I wanted to give it a modern twist. The fabrics are all from the Sultry range by Moda. There are 1536 1 1/2" squares in the mini checkerboard blocks"
It isn't actually too pink. I quilted it with green leaves and vines all over the non brown areas. In the brown Susan asked for a garden gate effect so it has brown curls in a wrought iron sort of style. These curls extend from the central area in the the brown sections at the sides of the quilt. We were both very pleased with how it came out. I was thrilled when people were admiring it folded up on it's way back to Susan at the Malvern show. For me that is something that really speaks volumes about the quilt. When such a small piece can inspire people. This is 'Stars Innit', made by Tet to test the new pattern Ferret Fractals, friendship stars. It seems to have been a very popular quilt. A lot of visitors came and talked to me about it. It is also the cover quilt of the pattern. It was made from fabrics in my stash, and we had hoped to be able to offer a kit to make on the same, but it would be only one kit. What do you think? 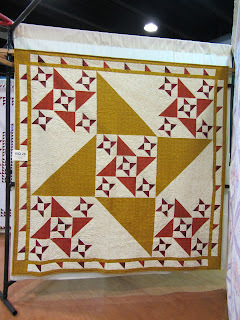 Should I make up one kit for someone to make a quilt just like this one? I really like the border Tet designed for the quilt. I stopped with the stars, as for me that is where the fractal principle took it. The border though does finish it nicely and I think I might have to get him to come up with a borders for the rest of m designs. This is my charity entry. I really don't like pink and there was no way I was going to make a pink quilt, but I couldn't let the charity down. So 'No effing p**k' was born. 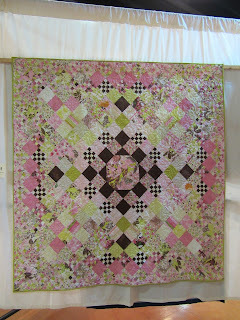 I knew this would never be a show winning quilt but I was determined to have fun with it. I tried out a lot of different threads, I tried blending two very thin threads as my top thread. It gets some very interesting results. Using a cotton thread with a metallic does support the metallic thread very well, but maintaining a good tension is tricky. It was certainly fun to have a play. 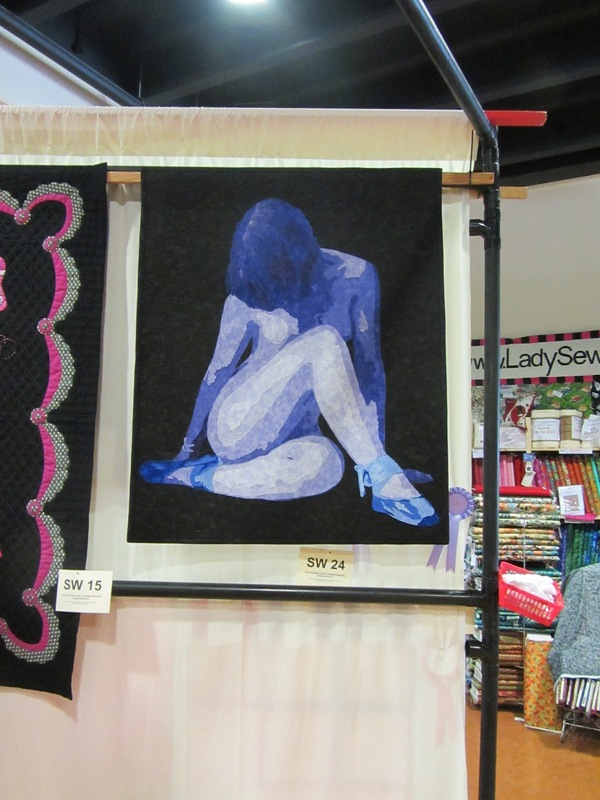 The background black quilting is many many patterns. 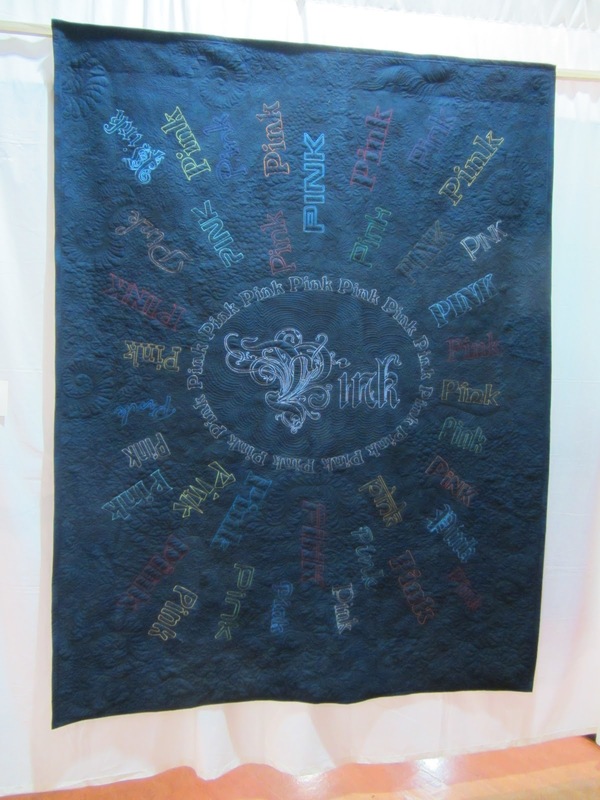 I figured that this quilt would be recycled as a teaching tool, so if I come to teach you machine quilting expect to see this quilt. 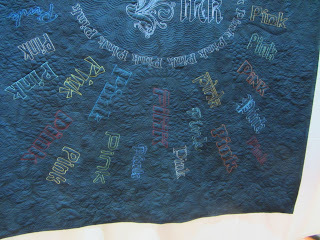 If you look back on my blog to May you will find a few close ups of the quilting. Remember that you can click on any of the images to see a larger version, where you should be able to see the background quilting quite well. 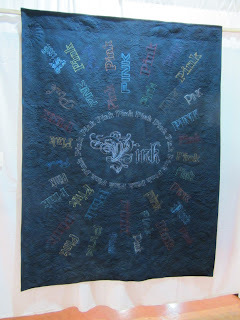 The other fun thing about this quilt was seeing what the fonts day to people. I could see several bands, and Blade runner (although none of the fonts are exactly right they have a strong flavour of something). My students spotted loads more familiar brands in the quilt. It's funny how distinctive a font is even when the word is completely wrong. Finally, a rather special picture. I've wanted to be able to do this for a while and things just came together on the Sunday of the show. 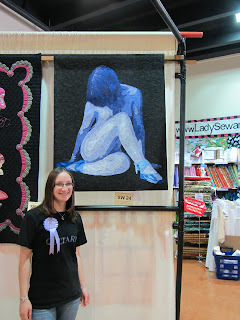 This is the model for Quiet Moment standing with the quilt. 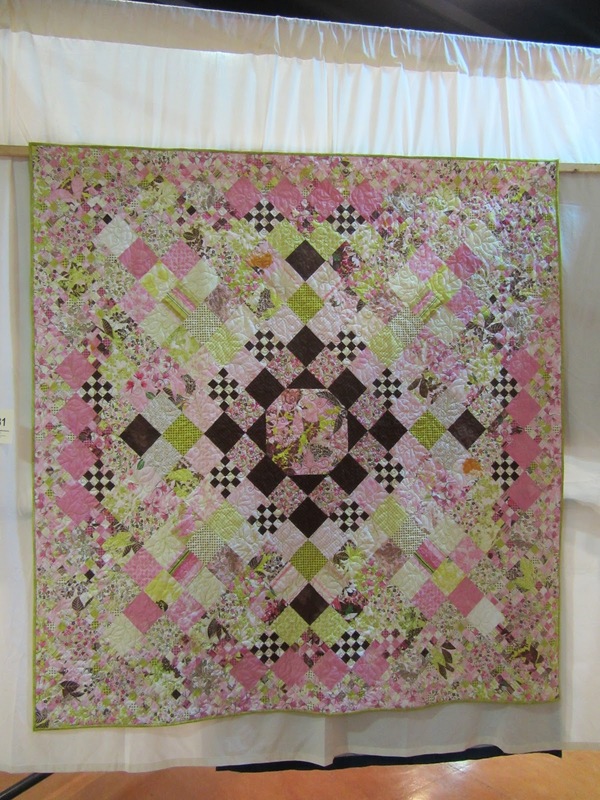 The rosette she is wearing is a Judges Merit that was awarded to the quilt. We have been trying to get the two of them together for quite a while but things just hadn't been working out. It was great to be able to use the free tickets from my entries to get her and her dad into the show. Even better she wore a branded t-shirt and was prepared to stand in for me while I was at the awards. I'm thinking it's a good sign when the model is prepared to stand with the finished quilt :) Oh and yes you are likely to see more quilts staring this model, just as soon as I have time to play. Speaking of time, I should be getting ready for tonights talk, where several of these quilts will be getting their next outing.